Hindsight is often depressing. 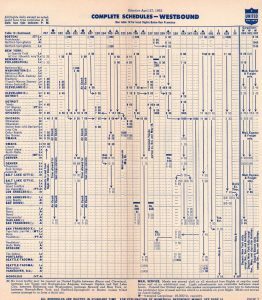 I was a commercial aviation enthusiast during my junior high/high school/college years of the 1960’s. During that time friends and I would visit airports and get timetables from the ticket counters, and we were on the mailing list of all the major carriers. But they were tools to see what airplanes we could see, and maybe which ones on which we could get an inexpensive flight. I certainly did not think of them as pieces of history to keep. 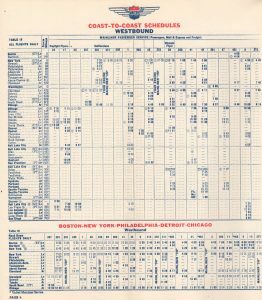 Oh, do I regret that I threw away all those Braniff, Northeast, Eastern, Northwest Orient, TWA, Mohawk, Allegheny, Continental, and United timetables. But today’s newspaper does not seem like it is history; you need to wait years, and have the foresight, to preserve these artifacts. Sadly I did not. But this was the time when jets took over the transcontinental travel (certainly the nonstop travel). There were a few propeller trips left (Northwest had an overnight “freighter” flight on a DC7C that was less expensive than day flights but made a long stop mid route). 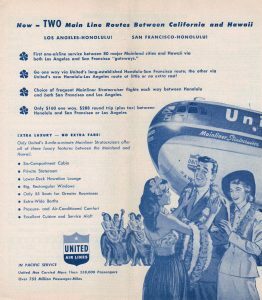 Being fascinated with something that did not exist anymore, I wrote to United Airlines asking if they had any old timetables. 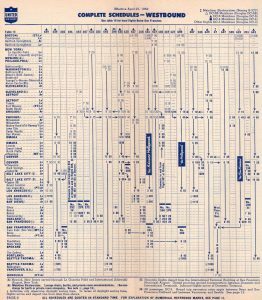 I was fortunate that someone kind in marketing helped my aviation enthusiasm and sent me a few timetables from the 1946 to 1958 time period. I wish I knew his (or her) name. 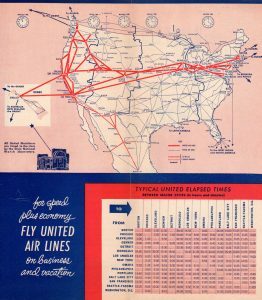 I am ever grateful because they did preserve a bit of airline history with me and I would like to share some of that wealth of history with you. 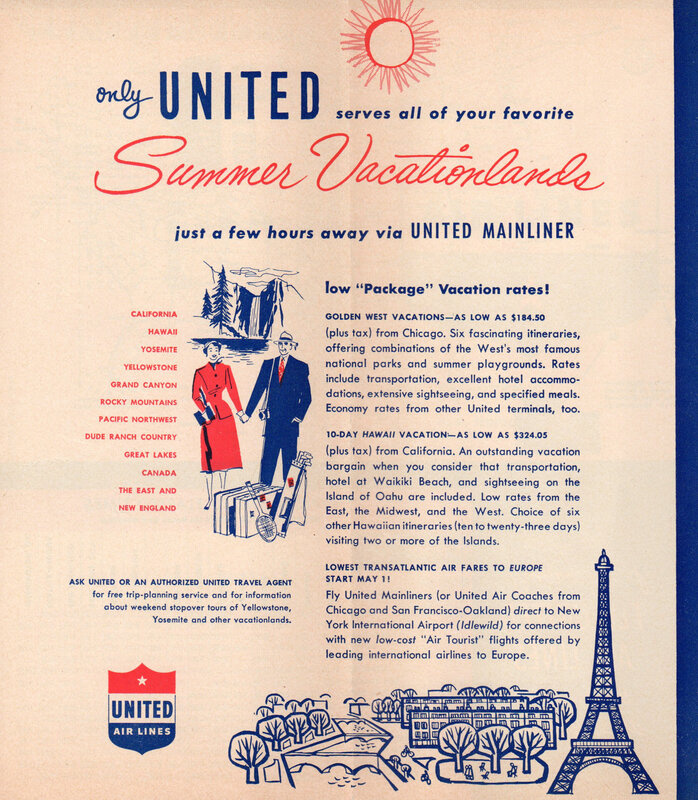 In 1946 United flew coast to coast with their ‘Mainliner 180’ (DC-3) and ‘Mainliner 230’ (DC-4) airplanes. 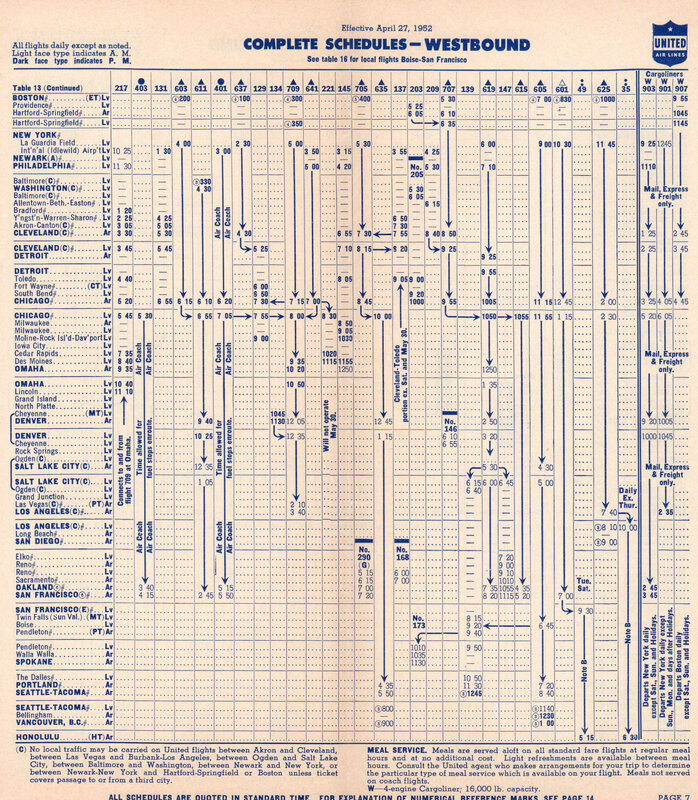 Note flight 1 (used by many airlines as their signature flight). 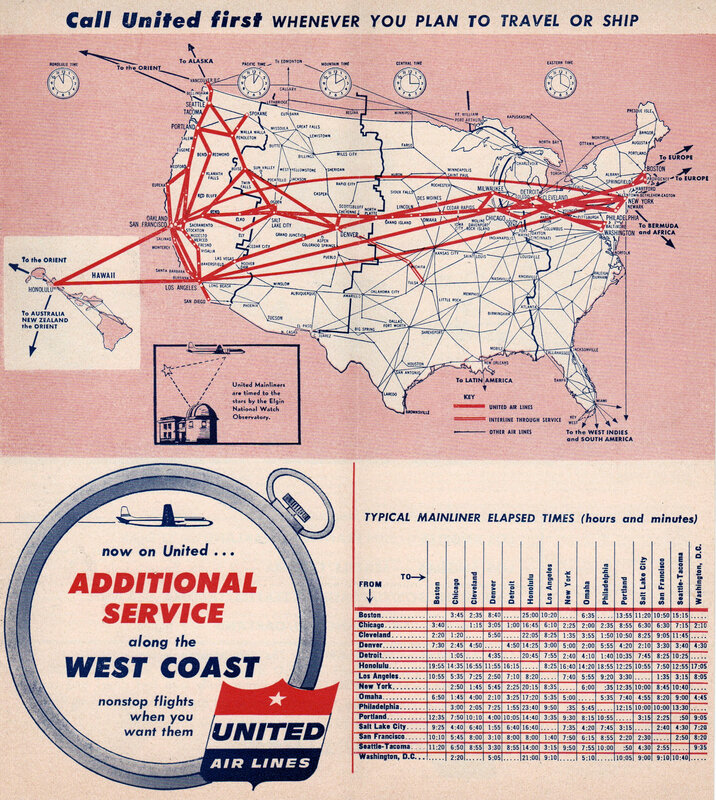 It is a DC-3 flight with many stops from New York to San Francisco. Note the small 1 in a circle. That indicates when a meal is served onboard. 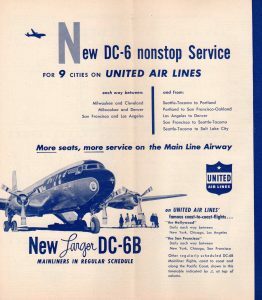 Then compare it to Flight 3 on the next page, which is a DC-4 and makes stops in Chicago and Denver on the way From New York to San Francisco. 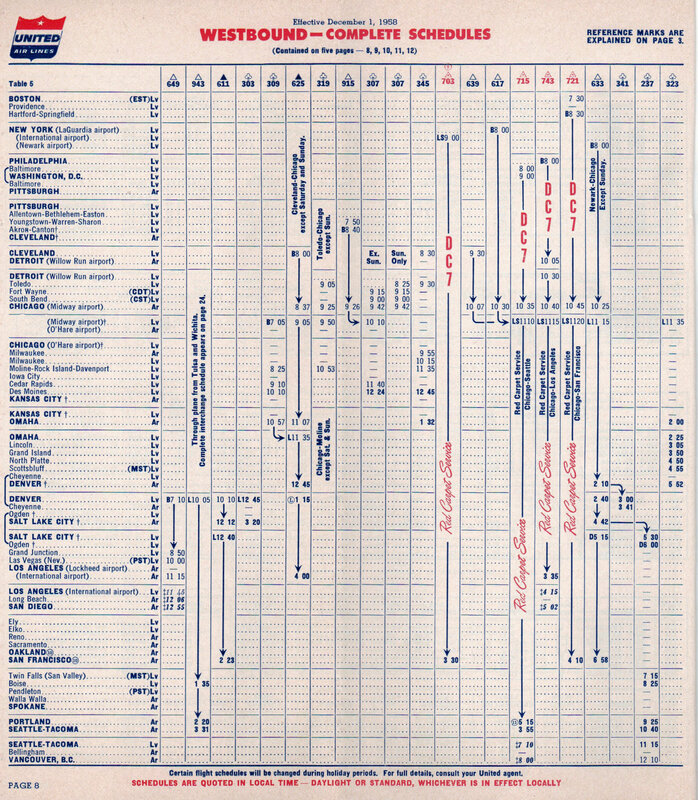 Timetables were also a great marketing tool for airlines. In 1946 United promoted its ‘Air Freight’ services. 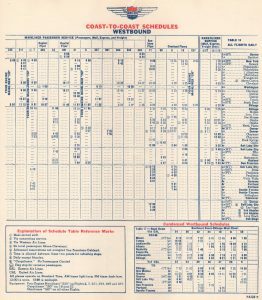 Reading the description, you can see that 25 pounds from Chicago to San Francisco costs less than a Priority Mail letter does today. 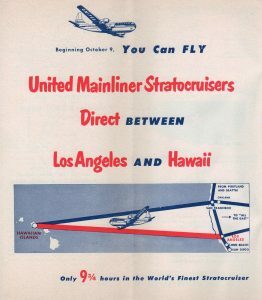 But timetable ads focused on passengers soon followed, as in these two 1950 ads that featured the pinnacle of luxury, the Boeing 377 Stratocruiser, flying between California and Hawaii. 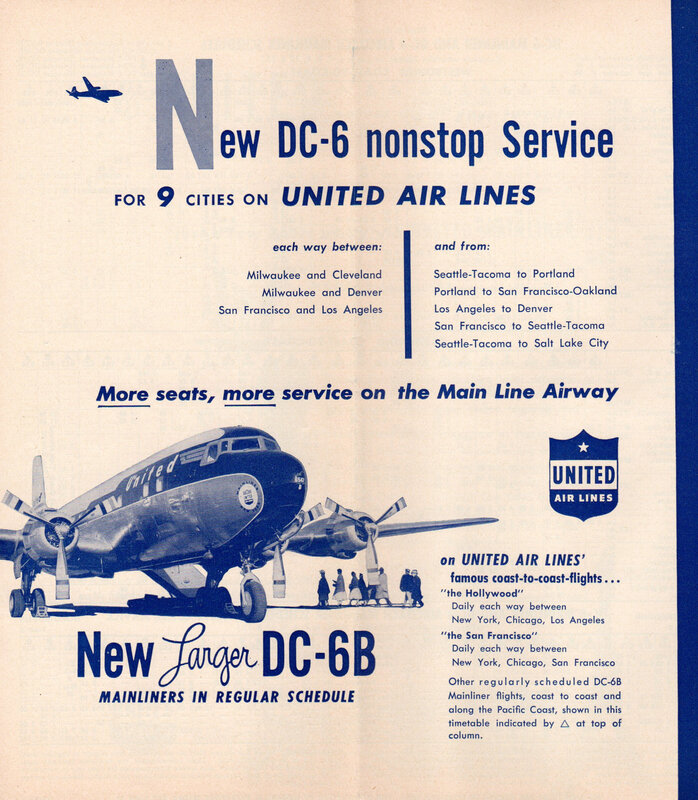 In 1952 the service expanded and got faster with transcontinental DC-4, DC-6 and DC-6B flights. 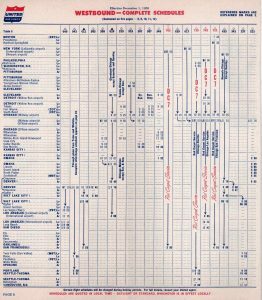 And the note on the bottom of the timetable page is a reminder that while an airplane may fly between two cities and carry through passengers, it does not mean the CAB has given route permission for carrying passengers between just those two cities. 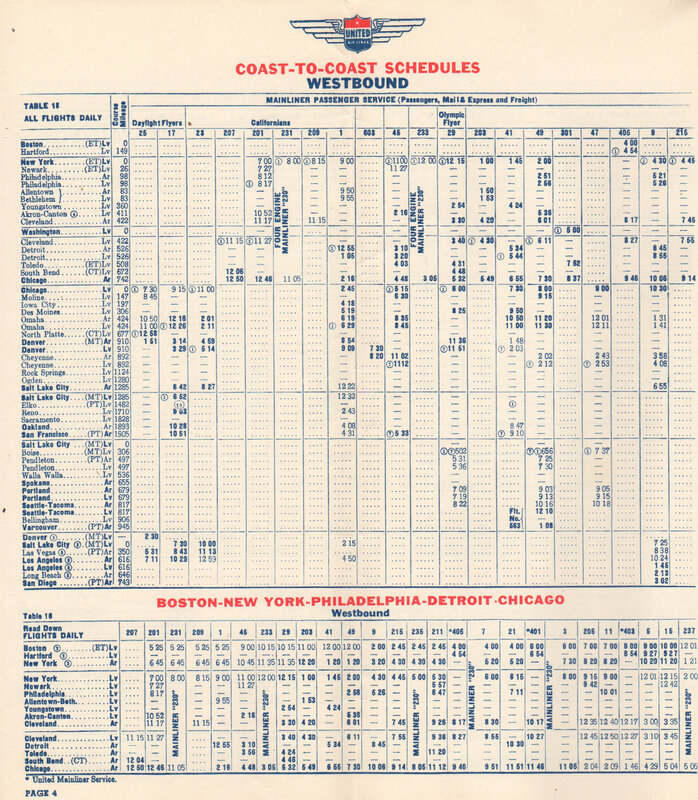 But the route map grows and the times between cities decrease. Ads in the timetables were getting to be more what we are used to in airline ads — vacation spots to exotic places, and new airplanes with “more seats and more service”. 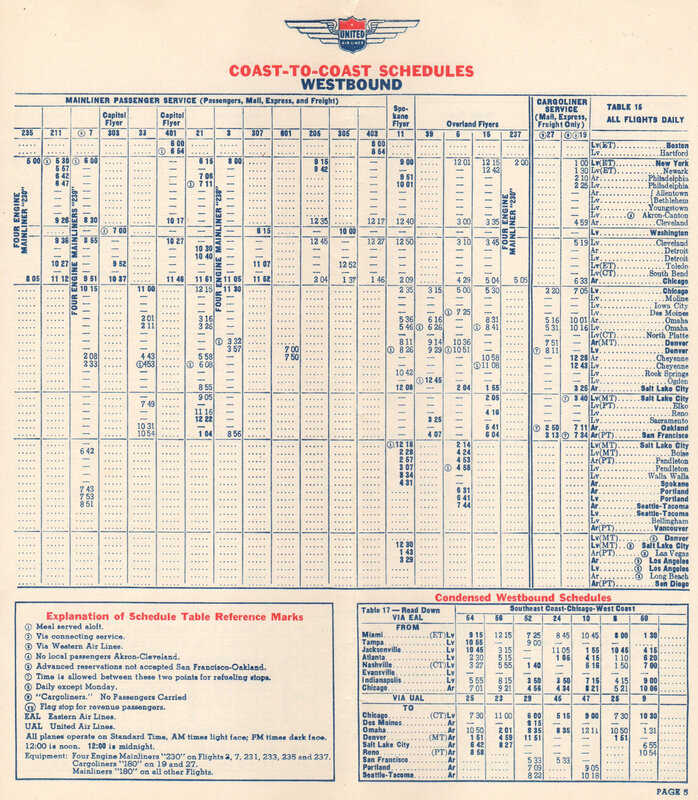 Then the last of propeller plane services, DC7 Red Carpet Service, is described in the following December 1958 timetable. Note that not only is a meal service offered, they tell you what you are getting (i.e. Lunch and Snack). 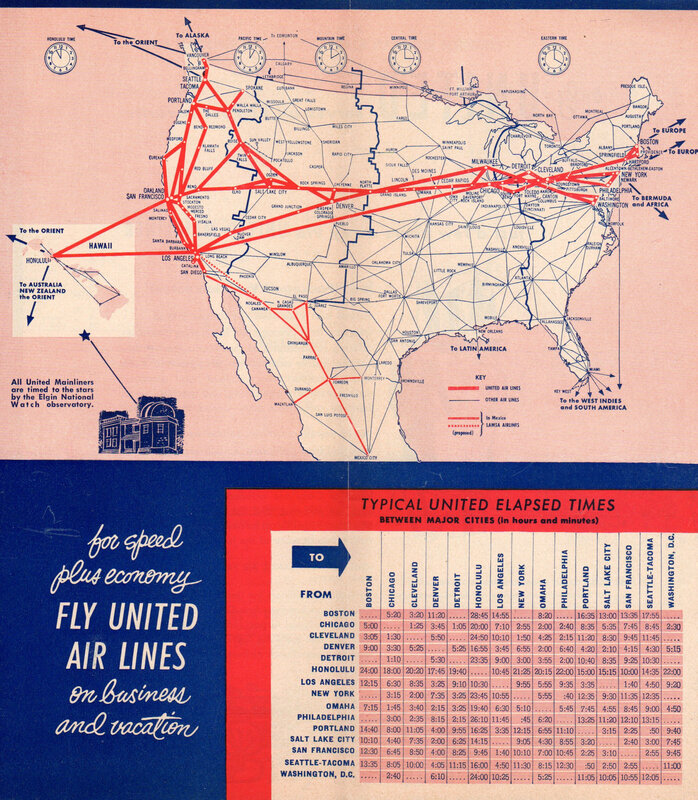 The route map has been expanded, and you can see the flight times have shortened compared to 1952. Flight 703 is a nonstop coast to coast flight New York to San Francisco. 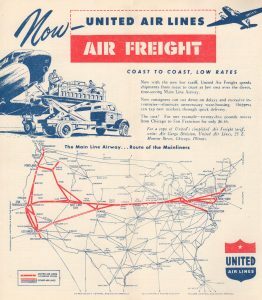 Other airports did have DC-7 service, but the flights connected in Chicago (something I did a lot flying United in the 80’s and 90’s). 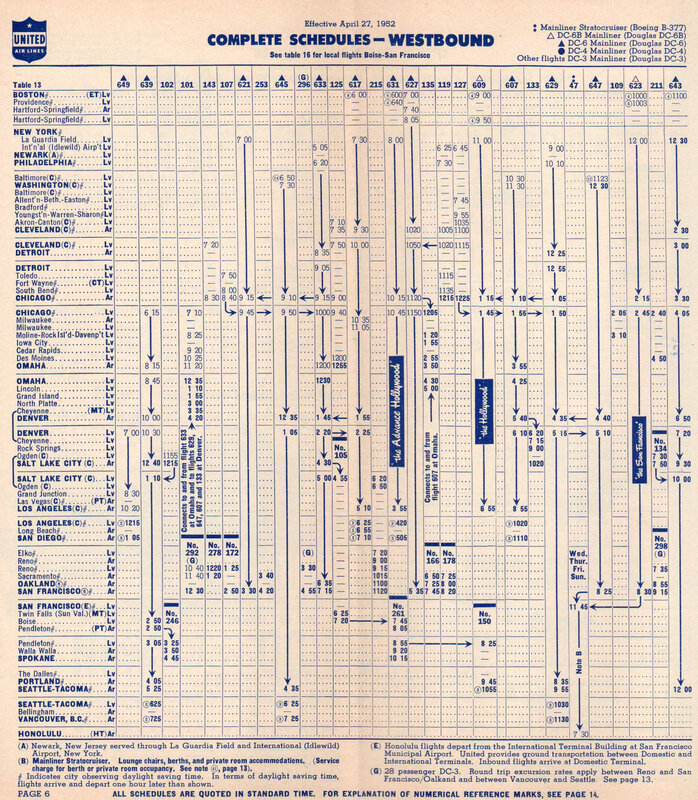 And looking at the flying time of 8 hours and 45 minutes for a New York to San Francisco flight—think of today. The flying time today is shorter, but between the car-park, monorail/bus to the terminal, security check and then the monorail/bus to the car rental facility—is it really any faster? And you did get Lunch and a Snack in those days! I hope you enjoyed this trip back in time.